:Americans are crazy about retirement. What does the Bible have to say, if anything, about retirement? What would a God-honoring and glorifying retirement look like? If retirement is probable for most of us, how should we plan for it as wise stewards of the resources God has entrusted to our care? In Reimagine Retirement, Chris answers these and other questions to help us construct a vision of retirement that reflects the values, priorities, and purposes that are most important to God. 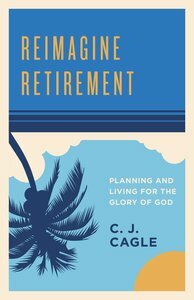 About "Reimagine Retirement: Planning and Living For the Glory of God"